Are You Suffering from Vertigo? What Can Help? Home/Vertigo / Dizziness / Menieres/Are You Suffering from Vertigo? What Can Help? Vertigo is a problem with the vestibular system. This system includes parts of the inner ear and brain responsible for processing sensory information. This information controls eye movements and balance. If something happens, such as disease or injury, to make this system malfunction, vestibular disorders such as vertigo can ensue. Vestibular disorders often come from environmental conditions or genetics. They also may occur for no known reason. The majority of these conditions have vertigo as one of their main symptoms. It is estimated that as many as 35 percent of adults age 40 or over in the US have had some form or vestibular dysfunction. Here are some things you will experience if you have vertigo. Feeling off balance: Many people who have vertigo feel as if their legs are on backward or they can no longer walk straight. Imagine yourself walking on a balance beam and holding each step steady as you put foot over foot. If you have vertigo, this would be nearly impossible. You may feel wobbly or need to use the wall for support when walking. Lying down or sitting still for a few minutes can help with symptoms for some people. Others need more serious help. Feeling nauseous: This is a really horrible feeling. You may feel as if you need to vomit but you do not, and the thought of eating is torture. Riding in a car or looking at a computer screen can be something you cannot do until nausea goes away. A home remedy for this, such as drinking peppermint tea, may help. Tinnitus: This is ringing, buzzing, roaring, or hissing heard within the ear. It doesn’t last very long, thankfully, and is more annoying than disabling. It is important to not crank up the volume of things that can damage your hearing, such as headphones, your television, or car stereos. A spinning sensation: When we were kids, we may have loved spinning around and around until we felt dizzy. As adults, it can be a very scary sensation when this hits out of the blue. This is especially dangerous if you are driving a car, working with heavy machinery, or climbing a ladder. You may feel as if you yourself are spinning, or the things around you may seem to be spinning. Vertigo always has a rotational component to it. Eye twitching: If your inner ear is inflamed or irritated due to fluid buildup, it can lead to a number of other issues inside the head. Eye twitching, muscle spasms, itching, or the need to rub your eyes may occur. A cold cloth placed over the eye and keeping your eyes closed for a few minutes can help. Thankfully, this does not last very long. Abnormal headaches or migraines: When you are dizzy or nauseous, it is common for headaches or migraines to develop as well. These conditions usually go hand-in-hand. If you happen to develop a migraine, you may find yourself stuck in bed all day until it subsides. It is important to drink plenty of water, rest in a cool, dark room, and put a cool cloth on your head or neck. Some people use pressure points between their thumb and forefinger to relieve the pressure. Vomiting: Vomiting definitely accompanies vertigo, particularly if you experience nausea. It usually lasts a few hours. If you vomit longer than that or for days at a time, call your doctor because you may have something more serious like the flu. Sweating: Sweating often accompanies vertigo and is one of the less-serious side effects, although quite annoying. Drink lots of water so as not to become dehydrated. Loss of coordination: It seems as if those experiencing vertigo often become clumsy or fall easily. You may find yourself dropping things, tripping and falling, or simply have problems going about your normal daily routine. When this occurs it is a good idea not to drive or carry heavy objects. If this lasts for longer than a few weeks, you should seek the advice of your medical doctor. He or she may be able to suggest physical therapy to help build coordination and physical strength. Problems with speech: You may find it hard to speak properly. 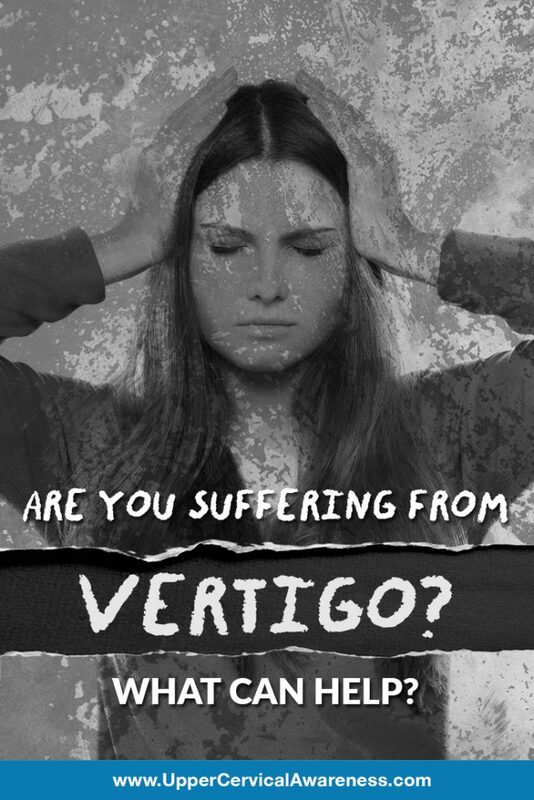 Vertigo is related to an inner ear condition but can also be linked to brain damage. You may be suffering from a concussion or brain injury that is causing this issue and vertigo. Double vision: This can be very dangerous while you are driving. It most likely has to do with calcium crystals in the inner ear shifting and hindering your brain from gaining proper balance. Head or neck trauma: This is often the root cause of vertigo and could have happened many years ago. If you have vertigo, it is very likely you also have a misaligned bone in the top part of your neck, either the C1 or C2 vertebrae. These bones can put pressure on the brainstem when they are misaligned and cause it to send improper signals to the brain about the body’s location. Vertigo is the end result. Upper cervical chiropractors focus on realigning these bones by using a gentle, effective method that does not require us to pop or crack the neck or spine. We encourage the bones to move back into place naturally, often leading to an improvement in or an end to vertigo symptoms. UCM Social Media Team2019-04-16T19:06:53+00:00June 3rd, 2018|Vertigo / Dizziness / Menieres|Comments Off on Are You Suffering from Vertigo? What Can Help?